There’s more to Modern Learning than delivering lessons on to smartphones. There’s more to Modern Learning than having a paperless class. And I’m fine with that because there is more to Modern Learning. So much so, that we are seeing more and more educators trying to define it even if others seem to be defying it. Walk into a K- 8 classroom and you’ll most likely see students and teachers using smartphones, tablets, MS desktops, Apples, and Chromebooks. Perhaps they’re inquiring about a recent lesson, or digging deeper into a passion project during Genius Hour? Maybe the whole class is playing Kahoot with their French teacher? From a distance it looks amazing. I have been the teacher who has witnessed all of the above and I’ll throw in a Google Classroom, TED Ed Lessons, Padlet, and raise you a Twitter. Can you hear the government types and administrators applauding and patting themselves on the back for allowing it to happen. However the applause should be for the educators who have led the charge to implement Modern Learning into their spaces. They are willing to take risks, try new things, and make mistakes to reach their Modern Learners. Teachers are in the trenches of learning everyday and understand the what, why, and how of their classrooms. To outsiders, visions of devices and technology in every hand sum up their understandings of modern learning. 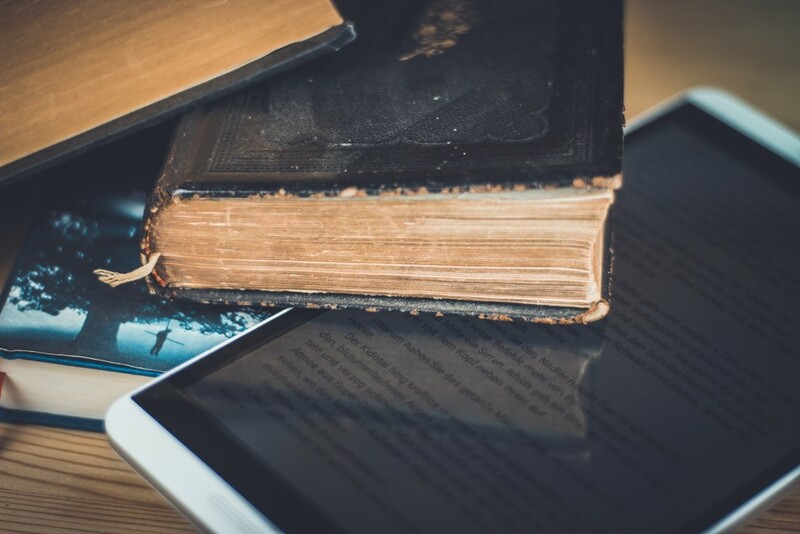 A cynic may equate Modern Learning as simply a shift from text books and worksheets to students completing digital versions of the same old thing. 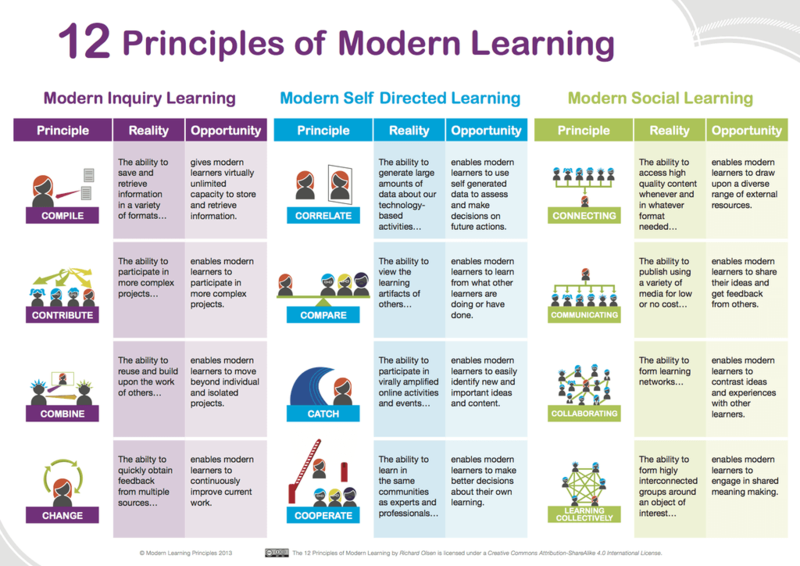 Keep in mind, “Modern learning” is not limited to tech use alone, but will be for this post. Technology in the hands of educators and learners has now become the conduit through which learning takes place. When modern tools and passionate instruction are paired, learning becomes more relevant and engaging to students. Imagine being able to ask a question and have time to search for the answer immediately with only a few keystrokes and clicks? Board wide access to WiFi means more and more students are taking notes during lessons using the technology at their fingertips. At the same time, teachers are gathering evidence of learning too. And, still others are watching a cool cat video or streaming music? It’s all possible in the modern learning classroom. However, as many educators have already discovered, the use of smartphones can be a friend and foe in the classroom and comes with a few caveats. Enhancing education is a complex, wicked problem because learning and teaching are multifaceted phenomena, involving biological, technological, psychological, social, economic and pedagogical factors. Reading this provides little comfort to my understanding of Modern Learning. In fact it leads me deeper down the rabbit hole in pursuit of understanding it better. Despite the wonder promised by all of this technology, students are still engaging with it far more often to connect and communicate rather than curate, create, and collaborate on content. The other day I observed a grade 6 student using a device at an inappropriate time. As I approached, she quickly hid it(an iPhone 6+). Like a phablet that size can be hidden. I asked what she was so consumed by on her device that she was defying school policy? She shared it was a fan site for Ariana Grande. Not the worst use of WiFi by a student, but off topic to be sure. After a few more questions I asked her to explain to me what she liked about Ariana Grande. We chatted about the March For Our Lives rally and about her performance. The convo continued and I got to know more about the student rather than defaulting to a YOU SHOULD KNOW BETTER moment, followed by the standard lecture on appropriate use of technology. Maybe this approach can be considered as Modern Learning too. If not, we can call it Modern Pedagogy that builds relationships and connections before asking students to fall into curricular compliance without context. 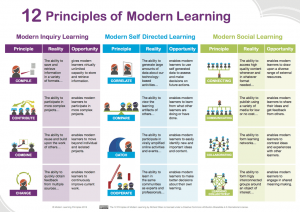 Maybe Modern Learning has to be willing to defy convention? By taking the time to discover her interests, some barriers were taken down. It was only afterwards that I suggested that classtime was intended for curriculum, and that I would suggest a Genius Hour activity in the near future where she could combine learning with her personal interest in Ms Grande – all the while helping other students discover, scratch, and share their own intellectual itches. At other schools, students are now required to lock their smartphones away for the learning day as an effort to reduce misuse and device distractions. What the link did not mention was that the school probably has students on computers or tablets as part of the instructional space. Anyone who has booked a computer cart or lab knows that students can become as easily distracted by these tools too. So what ends up happening are these absolutes and dictums from class to class and school to school. It is obvious that some teachers are more open to embrace this more easily than others. Perhaps it is an admin or system issue, but there does not appear to be a consistent policy about device useage in schools. The dissonance in all of this for me is that we ask our students to innovate, we give them the most amazing and powerful learning/communication devices on the planet and then expect them to be able to put them aside to listen to a lesson that is being pulled from a text book or source older than they are. In other cases, students are creating multi-modal masterpieces of identity and ingenuity. How about engaging and empowering them to use their devices for everything that is possible, trusting them to make good decisions, and having them create the criteria for use in classrooms? At the same time, educators can model appropriate use by sharing documents, links, updates, and evidence of learning via Twitter or class web sites. The technology is not going away. The when, where, why, and how it will be used needs some defining so that students are not seen as defying school when they use their devices. Then maybe Modern Learning can be more than just more with technology.